Computer Science Professor Francesco De Comité has a fantastic gallery of mathematical images on Flickr. 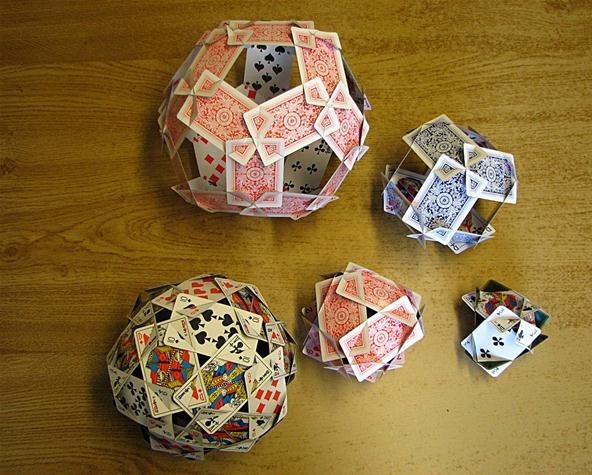 As part of this collection, he has a few hundred images of real or rendered polyhedra made out of paper or playing cards which he calls "slide togethers." 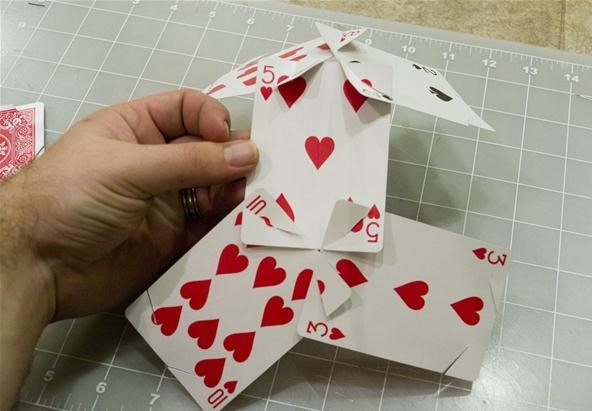 These are constructed by making cuts and then sliding one component into the other, creating a shape without using any glue. 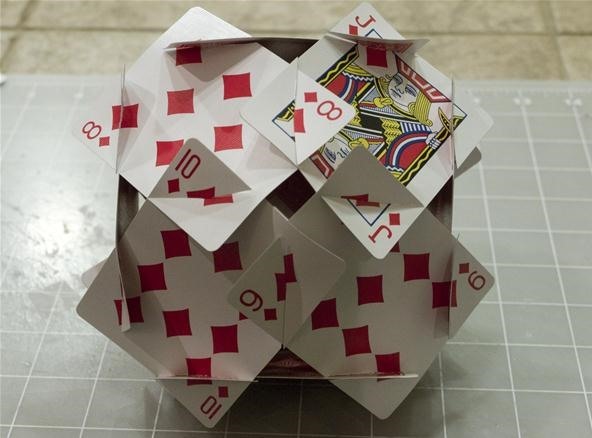 He constructed the entire set of the platonic solids—the cards form their edges—which can be seen in the image below. I became intrigued by these and had to figure out how to make them myself. Francesco did leave some templates and other clues behind. Using some creativity and trigonometry, I managed to construct my own templates and my own set. Note: The second from the right isn't a platonic solid. It's a truncated icosahedron, and you can see how to make one of those in my other post. Here's a downloadable template for the platonic solids so you can construct your own set. I recommend making the cube for ease of use and coolness factor. I would also recommend the dodecahedron. The others are great, but the aforementioned two are my favorites. Here's a short little tutorial on how to construct them. Download the template by clicking on the link above. Once you're in Google Docs, go to the upper left-hand corner, and click on "File" and then "Download". Print the PDF scaled at 100%. Do not leave the scaling at "Fit on Page". This will not work. Alternatively, click on "File" and then "Print PDF" in the Google Docs menu if you don't want a local copy. Again, remember to change the scaling to 100%. 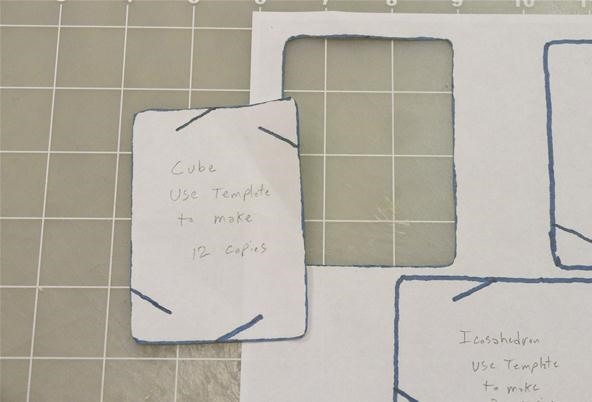 Cut out the template card. You should try to cut down the center of the line. Small errors shouldn't matter much to the end product. You can see the card behind the template. 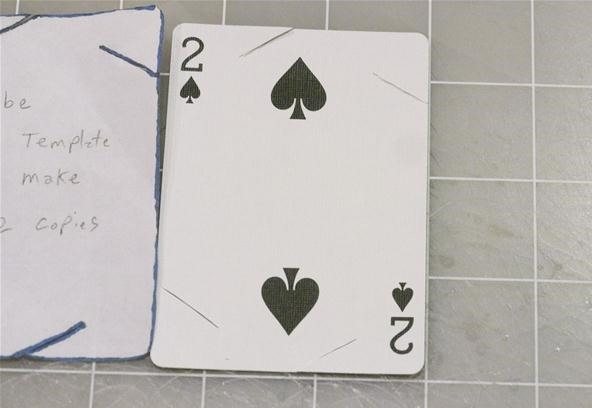 Showing the slots cut out on the card. Repeat until you have enough identical copies to make the desired polyhedra. 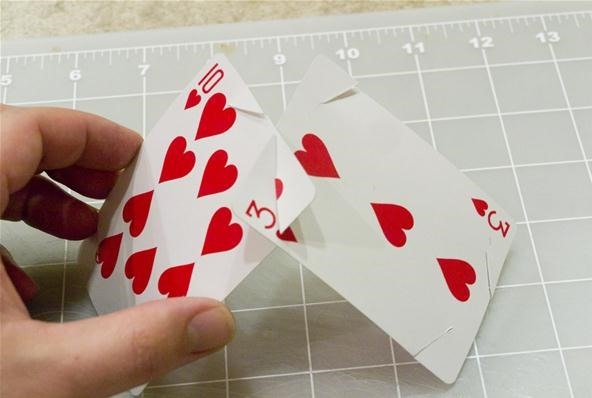 Using the slotted cards, slide one card into the other. 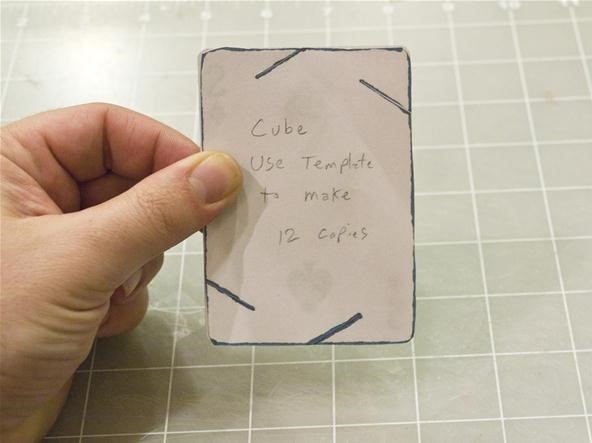 For the tetrahedron, cube, and dodecahedron, you should always have 3 cards coming together to form a point. For the octahedron, there should be 4 cards together to form a point. 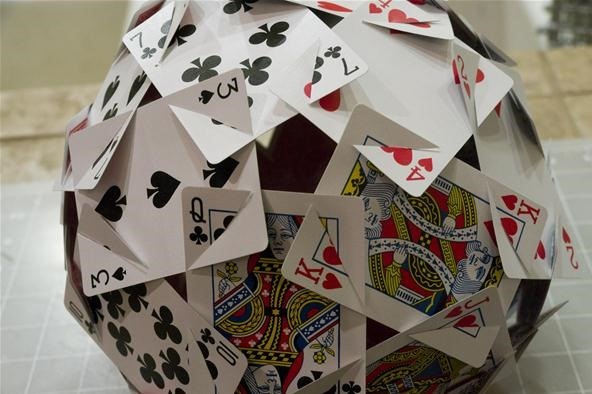 For the icosahedron, there should be 5 cards coming together to form a point. Putting the last card together at the point is always the hardest part because you have to slide two different slots into each other at the same time. 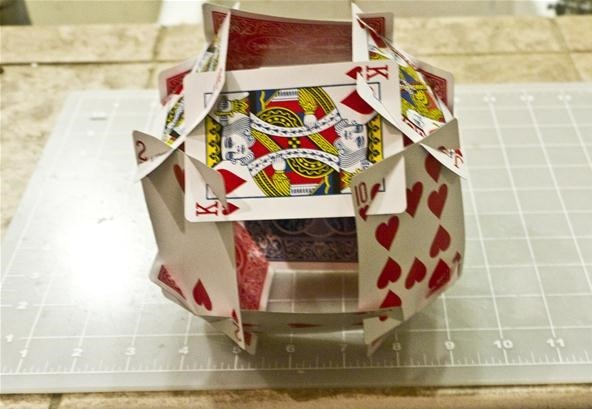 Placing the second card forming the full vertex (point) for the tetrahedron, cube, or dodecahedron. 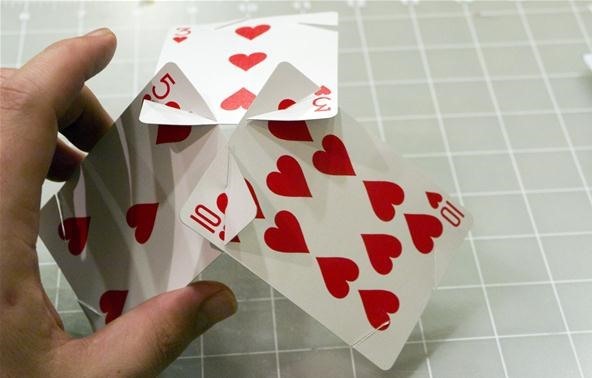 After you form one point, just continue making more points at the other ends of the cards. This will result in a polyhedral ball. If it starts looking lopsided, you probably miscounted. Step 4: Show Off Your Work! You've finished making the platonic playing card "slide together"! Now you need to figure out what to do with it. Be sure to post up a picture to inspiration section! We'd love to see it. I hadn't thought about that but the symmetries you see are pretty similar to what you would see in a kaleidoscope. 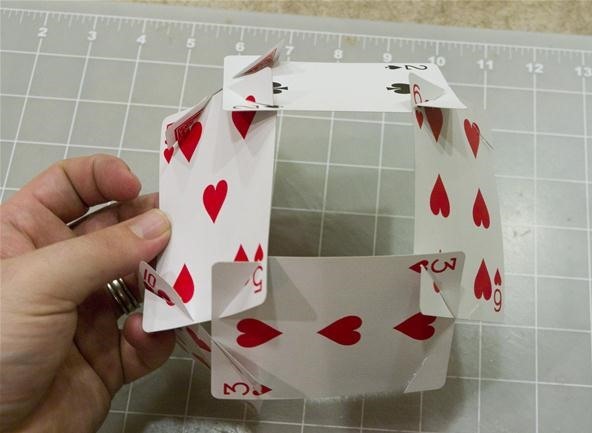 If I get a deck with two jokers I can make the icosahedron, the cube, and the octahedron with no cards left over. Having extra cards left over would drive me crazy. I went with the opposite approach. I bought a 12 pack of decks at Costco and now have to figure out what to build with all of the cards! My first thought were that you could do other kinds of figures like a twister. Oooh. That is a pretty cool lamp. That could actually work with the cards and some other structure that the cards fit into. Hmmm.... I think you just added a project to my list. Thanks! If you got a novelty hole punch in an interesting shape – maybe smaller, nested squares – and punched out that shape from the cards, and stuck a little lightbulb in there, the light would project out through the little shapes you made too, and I think it would be pretty. To create a sturdy object, would you suggest applying glue? Or are the slits enough? For these the slits should be enough. The tetrahedron, cube, and dodecahedron with the 3 fold vertices are quite strong. The octahedron is a little less strong, and the icosahedron is a little less due both to its size and its 5 fold vertices. Awesome John! Unfortunately I can't see those images. Could you post them on the corkboard here? have you figured out the math for the five intersecting tetrahedrons ? those are amazing. Are they yours? nah, a math professor, he leaves clues how to make them, and I have been able to figure out parts of the math. but where ever he is, the playing cards are a different size, vs the u.s. so I am having issues, so I have not been ready to give it a try yet, plus apparently they one I am trying is pretty hard. wow. That will be pretty awesome! I'd just like to point out that it is the angles that matter with these slide togethers and that the slits should go half way to the other edge. You are right for sure...but I don't really know the answer. The angles should all be the same...so perhaps you could do some test cuts and then set the angle. I've always calculated all the angles using "simple" trigonometry but without spending a lot of time thinking about it your angle calculation gets pretty complicated. 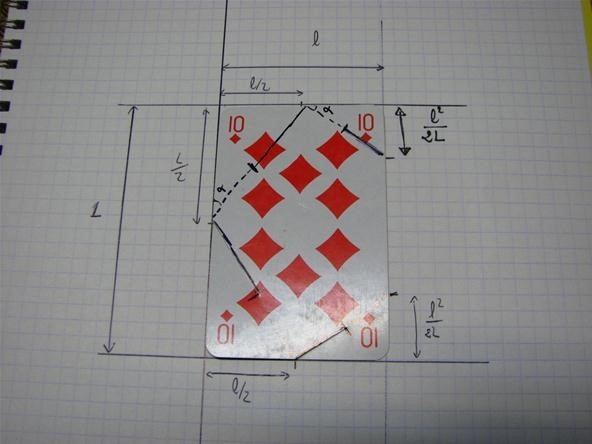 You could probably get a really good guess by building the card model and looking at the angle that was formed...and then do some tests. I made the icosahedron for a project. I have to say how many vertices, faces and edges it has. Not sure if I need to take into consideration the corners sticking out of it. Can anyone help me?